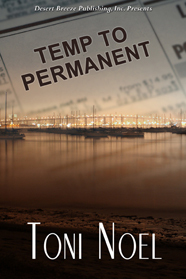 My guest today is author Toni Noel, author of Temp to Permanent, and also Lawbreakers and Love Makers. Interesting titles, Toni! In Temp to Permanent the harried owner of an advertising agency calls for help on the busiest day of her career and the agency send a male temp with no apparent business skills on his resume. His looks are a different story entirely, and as he puts his excellent office skills to work, Carina Carrington can think of only one thing, Getting Greg Lawless into her bed. It's not until later, when strange things start happening at work, like the petty cash disappearing, and Carina suspecting Greg that his true skills come into play and he saves Carina's life. Writing about two characters who both want the same thing, but the governing sexual harassment in the work place prevent either of them from acting on their desires was fun. Finding new ways to put them together and turn up the heat made my writing day. Do you live in the mountains, desert, forest, lakeshore, city, or _____? I live in the city, not far from a five acre recreational reservoir. I take my two mile daily walk there at least once a week, where I can watch white swans, ibis and blue herons ply the shoreline where fishermen line the banks. I like mysteries, so John Grisham and Lisa Gardner top my list. Nicholas Sparks is another favorite, and I'm a sucker for a happy ending, so romances by Debbie Macomber, Elizabeth Lowell, Sharon Sala and Judith Ivory never disappoint me. When writing your description of your hero/ine what feature do you start with? Eyes, age, hair color, personality, name, etc? I have a fascination with eyes, the color, the sparkle, their ever-changing depths, but find these the hardest physical characteristic to describe well. I'm very observant, and when I see eyes that interest me I store the image in the back of my mind to use at some future time. The eyes of a five-year-old boy inspired the temp's eyes in Temp To Permanent, scheduled for release by Desert Breeze on June first, That boy will be a lady-killer when he grows up. I'd recommend Law Breakers and Love Makers, because it was the most fun to write. I've heard that when your characters take over the writing the novel is usually first rate. I don't know about that, but my book is certainly a fun read, and a reviewer at The Romance Store gave it five hearts.. I write novels about finding safe havens for the heart and hope my readers enjoy the satisfying resolution to their conflict my characters achieve. Why Not Me? Actually that's the title of the memoir I wrote for my daughters, telling them about my life through age 18. You Are My Sunshine, I guess. I try to always stay upbeat, and not let things get me down. Friends describe me as a tactful southern lady, always looking for ways to smooth out the bumps in other people's lives, so I'd be a power sander handled with a gentle touch. You can erase one experience from your past. What will it be? That's a difficult question to answer. I have very few regrets. A car accident I had in Las Vegas years ago, I guess. "Caution..Do not inflame." I have my father's temper. His coworkers nicknamed him Fire Ball. I'm slow to anger, but when really riled I get hopping mad, which leaves me sick for days. A true romantic, I'd be a Victoria's Secret store, surround myself with smooth satin and fine lace, and when there were no customers, I'd simply stand around and touch. To whom do you give the credit for your writing success? That of course would be my husband Jim, who has never lost faith in me. Joyee, why don't you start with telling us a little about yourself? I'm a born and raised Chicago girl. I graduated from University of Illinois Urbana/Champaign with Finance and Political Science degrees. I'm currently in the process of finding a place in CO and working to move there. I traveled there recently and really liked the area. I'm actually kinda boring, lol. I work 80-90 hr work weeks, I'm pretty much attached to my laptop. My pup Marius and I live alone, no kids, not currently dating. We like calm and quiet. I rarely get it, but it's a goal in life! You write solo and with Stormy Glenn. How did you meet Stormy and decide to write together? I emailed her with an outline of idea for the Delta Wolf series, some of my own works in progress, and pretty much just begged she give me a chance. Luckily she liked the idea. Who has been the most delightful character to write about? The most challenging to write about? That's hard to answer… it's kinda like picking a favorite family member. All of my main characters, have at least a little bit of me in their personalities in some form or another. Riley from the Marius Brothers is one that's a LOT like me I think because if I could do college over again in an alternative universe I would have gone to medical school so he's my vicarious living. Reed in Lust and Vamp was challenging because it was a way for me to work some things. The way he dances, what it means to him is how writing is for me. So it was very challenging to get it just right for my perfectionist personality. Isaac Dragos: Beyond the Marius Brothers #1 was actually a demand from Stormy Glenn's and my own Yahoo Group. Isaac plays a vital role in Remus: Marius Brothers #2 and after #3 came out, they started talking because I said I was going to work on Victor #4 that was released last month and holy crap did everyone just jump in and beg for his story. Which was a trip for me because I'd never thought to give him one. I promised I'd think about it… and when I did I sat down and just cranked out 17k words the first day I worked on it. It was CRAZY and just took a life of its own. It's chronologically after Victor #4, but since he's not a Marius Brother I gave him a spin off series name in case I come along other characters in that world that need a story as well. Both. I have my books in a loose outline, most times I stick to it, adding some developments that pop up as the story progresses. There was a lot of back story to retell, not so much research beyond re-reading and getting back into the books I wrote months and months ago. And while that might sound like an easy write, it's not. There's already established timelines, and plot advances that I ended up spending so much time trying to fit Isaac's story and side of things into the timeline. There was a lot of notes, a lot, lol. Have you ever experience weird cravings while you write? If so, what kind? Besides chocolate… Alana, the brat, got me addicted to Cheryl's frosted sugar cookies. I normally work on one writing project in a day. But I'm always involved with other projects at the same time. Right now I'm holding a fundraiser in my Yahoo Group for the Braille Institute that helps blind kids learn to read and gets them access to books. I'm also working on a bar crawl for the Gay Romance Lit Retreat in New Orleans in October. Which authors works do you enjoy reading and do you have any other authors that you bounce ideas of? My dreams or nightmares, believe it or not. A lot of times I have some crazy dream that develops into something I can use in a story and I just run with it after I mull it over. I would say Micah: Marius Brothers #1. It's one of my first books that had two spin off series come of it and over all I've gotten the most positive feedback on. Which of your characters would you most likely fall for if they were real? That's hard to answer… it's kinda like picking a favorite family member. All of my main characters, I have at least a little bit of a crush on since they are my type of man in one way or another. http://www.joyeeflynn.com; Facebook and I have a Yahoo Group. Available now at Siren Publishing! When Carson's old inner circle is challenged and overthrown he knows that he will become the Omega for the new Alpha and his Betas. After all he barely survived the abuse dished out by his last circle and he knows that, as defective as he is, he can only hope to keep the punishments at bay for so long. Declan, Ian, and Taylor have never wanted to run a pack, but after seeing Carson and realizing how he was being treated at the hands of certain members of the pack, they couldn't stand by and let him suffer. But while they may have won their dreamed of Omega they quickly find it becoming a nightmare. Can they help their Omega realize his worth or will he forever be an Omega without hope?